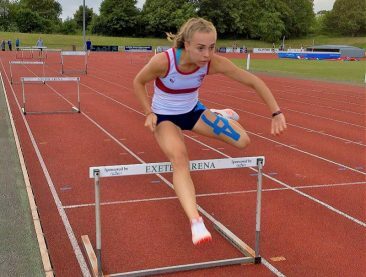 Last Saturday, young athletes, from all over the South West, descended on Exeter Arena to compete in the South West Schools Athletics Championships. Competition was fierce as all were vying for a place in their County Team for the English Schools National Championships, held in Birmingham, on 13th & 14th July. 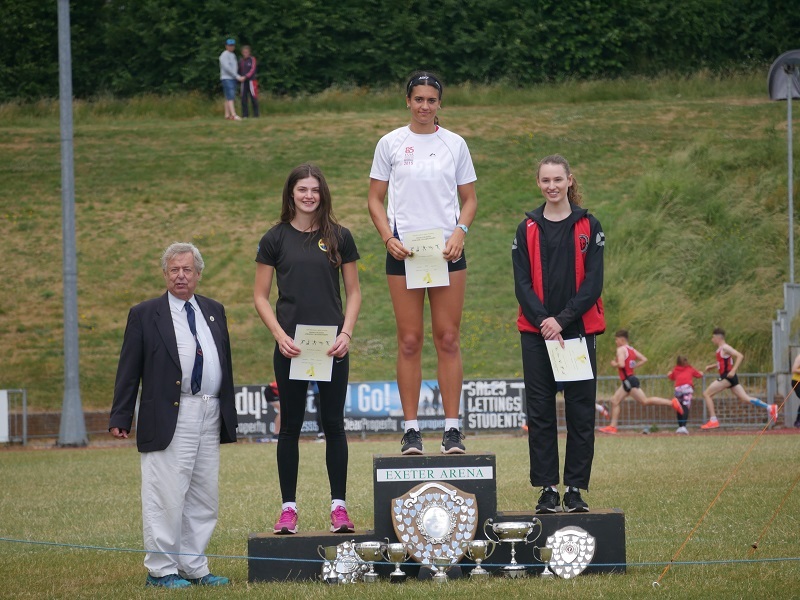 Athletes were looking to gain an entry (ES) or, in some cases, national standard (NS) performance, if not already achieved at the County Schools competition the previous weekend. 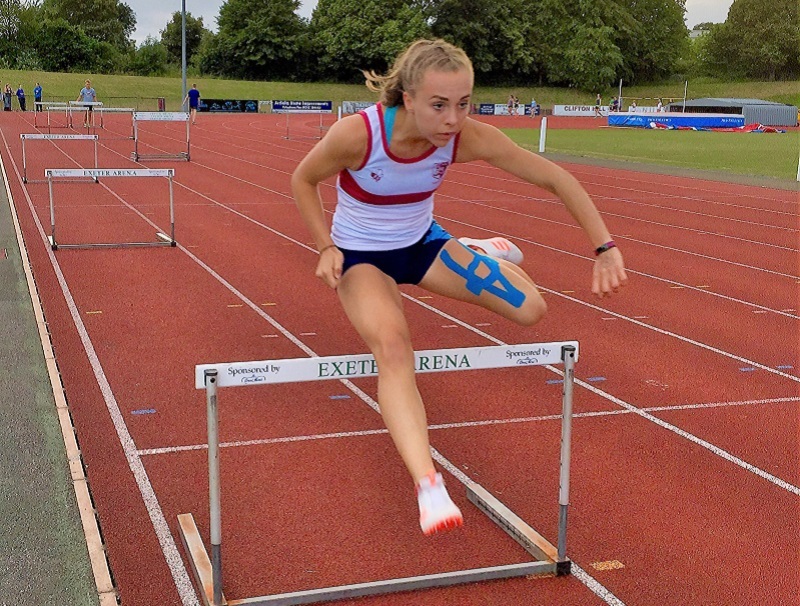 At the Devon Schools Champs, U15G Katie Chapman jumped 5.33m (NS), securing 1st, in the long jump and ran 11.60 (ES) in the 75mHu, again, placing her 1st. However, on Saturday she smashed this time with a run of 11.09 (NS), a new PB, catapulting her to 1st on the UKA rankings. She followed this up with a 5.72m (NS) jump in the long jump, a further PB, placing her 2nd on the UKA rankings. 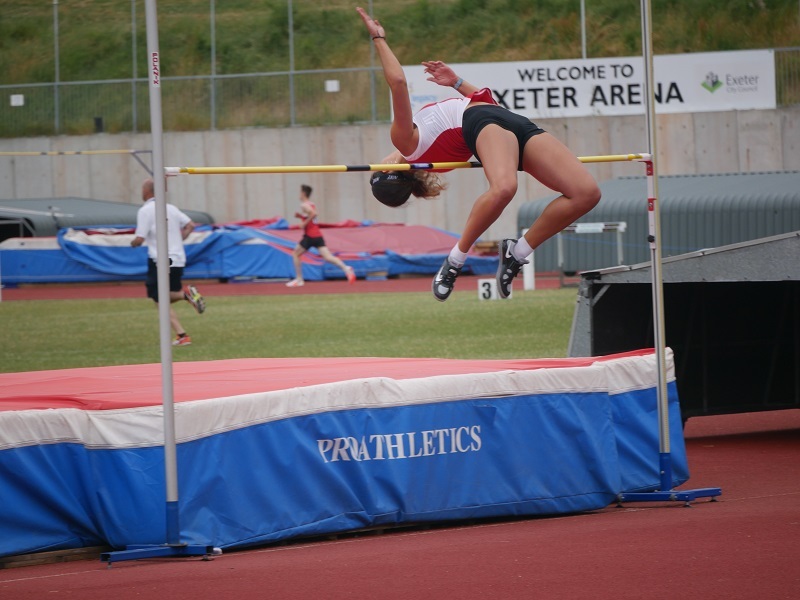 It was Lucky 7 for Olivia Dobson winning the U20W high jump with an Equal Championship Best Performance of 1.75m (NS), a record set in 1977, and a new PB. This jump places her 7th on the UK rankings. The previous week, at the county event, she won the U20W shot with a putt of 12.78m (NS) also placing her 7th on the UKA National Rankings and came 2nd in the Javelin, with a throw of 39.08 (ES). 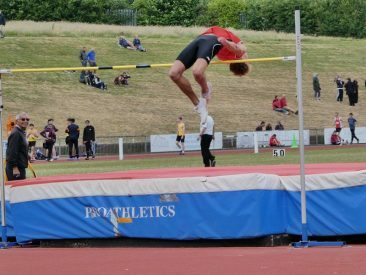 U15B Daniel Hamilton-Strong jumped 6.06m (NS), a new PB, in the long jump and then went on to better this at the South West Schools with a 6.10m PB performance. He also won the 200m in a time on 24.09. At the County round, U17M Josh Tyler achieved National Standard in the shot, with a putt of 15.24m, placing him 4th on the UKA National Rankings. Tyler also came 1st in the discus with a 39.80m throw. At the South West Schools he placed 1st and 3rd respectively. Jack Turner, U20M, ran a new PB in the 110mHu, at Somerset Schools, in a time of 15.15 (ES). 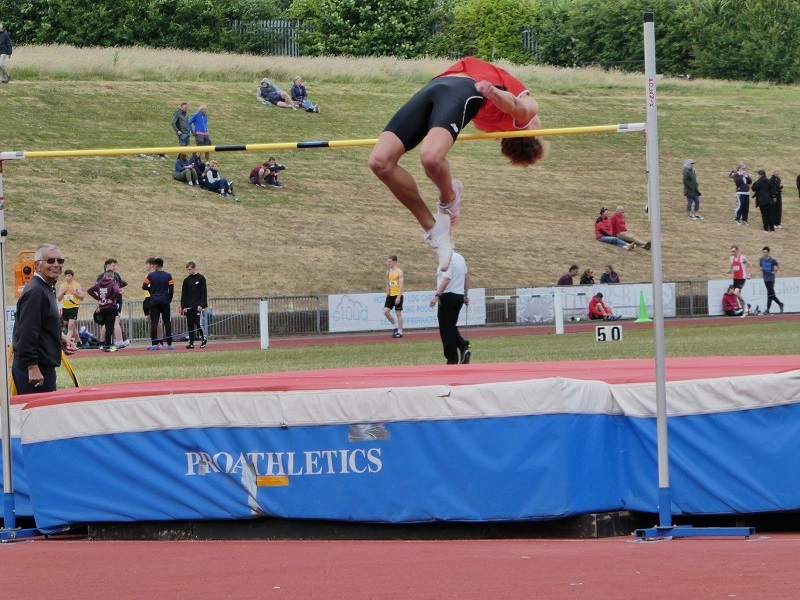 However, for the South West round he switched to the High Jump clearing 2.04m (NS), a new PB, securing the win and placing him 6th on the UKA National Rankings. 800m U17m Will Bond came 2nd at South West Schools in a time of 2:03.87, a new PB. 800m U15B Louis Chamberlain 2:10.27 and was 3rd in the SW Schools. 800m U17W Molly Canham 2:13.59 (ES). Canham also gained ES in the 1500m with a run of 4:43.73. She also took 1st in the 800m at the SW Schools. In the Minors competition U13G Scarlett Livingstone ran 2:25.17 in the 800m a new PB. 1500m U15B Oliver Capps 4:30.79 with a further run of 4:30.91 (3rd) at the SW Schools. 3000m U17W Caitlin Smith 10:56.86 and followed that up with a 2nd the following week, at SW Schools, in a time of 10:42.88, a new PB. 2000mSC U20M Elliot Moran achieved 1st place at the South West Schools Competition, in a time of 6:09.94; a new PB, (ES), and placing him 10th on the UKA rankings. High Jump U15M Leon Biaggi (2nd on countback) with a 1.65m jump. He improved on this at SW Schools placing 3rd with 1.70m clearance. 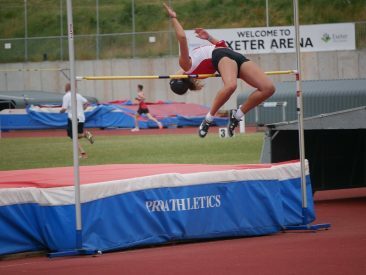 High Jump U15G Megan Hamilton-Strong achieved entry standard at the South West Schools with a 1.58m Jump placing her 3rd. 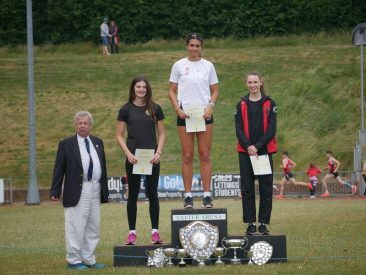 Long Jump U15G Chloe Harris jumped 5.15m (ES) at the SW Schools, as well as a wind assisted 5.22m (NS) leap. Long Jump U17W Kitty Dart placed 2nd at the SW Schools with a 5.23m PB jump. Triple Jump U17m Michael Bowley 12.44m. A wind assisted jump of 12.64m place him 1st at the South West Schools. Triple Jump U15B Fin McGill 10.95m, achieving a PB of 11.78 at SW Schools. Shot Putt U20M Gediminas Vielius 12.60m PB & Discus 35.61m. A putt of 12m placed him 4th at the SW Schools. In the Minor’s Competition U13G Isabella Peyton-Jones achieved a 8.70m putt in the shot.